Determined to Develop - Why Malawi? 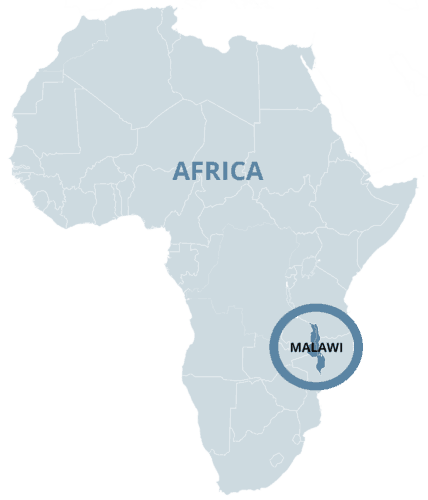 Malawi is a small landlocked country in southeastern Africa. One of the smallest countries in Africa, it is tucked between Tanzania, Mozambique and Zambia. Malawi’s history is rich. It is in this region of Africa where the earliest humans lived, establishing the roots of language and storytelling. Many of today’s Malawians are descendants of the Bantu people who moved across Africa for hundreds of years before national borders were established. Evidence of complex trade networks can be seen today in the strong Islamic influence which preceded Christianity, introduced to the region by missionaries like David Livingstone. During the colonial period, the country was incorporated into the Federation of Rhodesia and Nyasaland. Nyasaland achieved independence in 1964, renaming itself Malawi. Malawi is referred to as “The Warm Heart of Africa” by both locals and visitors for its friendly spirit and welcoming people. With a population of over 19 million, Malawi is one of the more densely populated countries in Africa. Most of its people live in rural villages and practice subsistence farming. There is a diverse mix of cultures, with the Chewa being the most populous tribe. Other tribes include the Yao, Nyanja, and Tumbuka. Dance is a central tradition within each tribe, the best known being the Chewa’s Gule Wamkulu. Despite its small size, the scenery of Malawi is diverse, including everything from river valleys, to lush green plateaus, to forests, to grasslands. The highest peak, Mulanje Mountain, is an astounding 10,000 feet, while the lowlands are barely above sea level. Malawi’s nine National Parks and Wildlife Reserves contain a diversity of flora and fauna, in addition to animals like elephants, lions, and zebras. Perhaps its greatest natural feature is the famous Lake Malawi, Africa’s 3rd largest lake. This “Lake of Stars” makes up 1/5 of the country’s area and is critical to the economy. Resembling a real-life aquarium, it contains over 1,000 species of tropical fish, many unique to the lake. Despite the country’s beauty and natural resources, poverty continues to be chronic and widespread in Malawi, ranked 170 out of 188 countries on the Human Development Index. Malawi’s development is hindered by a fast growing population, limited arable land, natural disasters, food insecurity, HIV/AIDS, and a high incidence of malaria. Almost 50% of the population is under the age of 15, and a large number of these young people are living in poverty. Poverty threatens an individual’s most basic rights to survival, health, nutrition, and protection from exploitation. In addition, poverty threatens access to education. Knowing that education is both a fundamental human right and a key component of development, Determined to Develop is dedicated to empowering, through education, the people of Malawi to become agents of development for their families, communities, and Malawi as a whole.